This is really neat. Thanks for sharing how you did this. Looks like a simple “Turn left” design. Um. So once it’s learned a maze, what happens if you put it somewhere else, or in a different maze? Does it recognize this isn’t what it remembers and go back to searching? Needs Robot cheese, a small rf transmitter it always goes to through the maze. Left first is my fave too. Unfortunately, this “left hand on the wall” method of solving a maze will often-times not work, especially in a competitive environment. Maze designers will most certainly not build a puzzle in which this method will work. Imagine a maze with a ring around the outside edge. The method mentioned in his article simply will not work, as the bot would just go ’round and ’round… never making a right turn unless forced to at the edges. 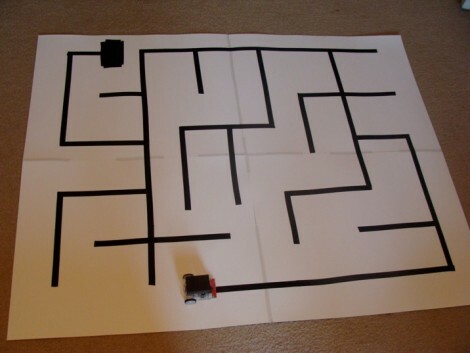 A much more common method for maze solving robots is the ‘flood-fill’ or ‘modified flood-fill’ algorithm. You are correct that this left hand on the wall method does not work on mazes with loops. That is something that is pointed out in my article. I have looked a little into flood fill and it appears that the robot has to be programmed to know where the end of the maze is. In these competitions normally the maze is setup in a grid and the end is in the center. If the ending is anywhere in the maze then I believe all bets are off if the robot is not programmed to know where in the grid the maze is. I could be wrong because I have only read a little on it.